As soon as possible discard the solution the grains have been transported in, rinse them in fresh water and use them. Otherwise, rinse them off and put the grains in a solution of 2 cups of fresh water and 4 tablespoons of dissolved sugar. Store in a jar or bottle with a lid and use within a few days. You will need to rinse and change the water solution every few days (I have been away for 2 weeks and they were fine when I got home- they will freeze and thaw ok too) to keep them healthy. Ensure the grains don't come into contact with any metal other than stainless steel. I use plastic and glass for all my preparations. 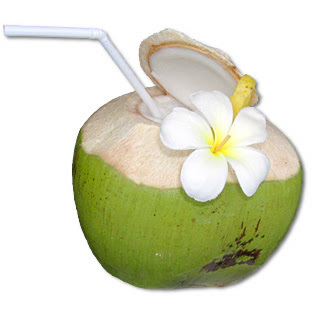 I use 2-3 tablespoons of Water Kefir grains to 2 fresh green coconuts. Place the fresh coconut water into a sealable jar or swing top bottle, add the 2 tablespoons of water keffir grains (the bag I have given you is roughly 2 -3 tablespoons) cover the jar/bottle with some breathable material to stop bugs getting in (like cheesecloth)and let stand on the bench in a shaded area (or in a cupboard) for 24-48hrs (depending on temperature-longer in colder months). After standing period, strain the liquid to remove the grains, the liquid may be quite fizzy at this stage (but not always). You can drink the liquid now or do a 2nd ferment. I like to add about half a cup of fresh fruit juice at this stage for a 2nd ferment although this is not necessary. I have tried lime, pear and passionfruit so far. The lime had a clean taste to the finish, the pear was very subtle but the passionfruit had a much more appealing flavour and I have heaps on the vine at the moment so have stuck with the passionfruit. Seal the bottle/jar and leave standing for another 12hrs (a bit longer if it is cool weather). You will notice bubbles accruing on top of the liquid, this is normal. Leave a space between the lid and the liquid as a fair amount of gas is produced, so it needs room to expand. Place in the refrigerator and enjoy. During this process your kefir grains should have grown and multiplied, rinse them off and start another batch or store them in the refrigerator using the instructions above. If you look after them, they will last indefinitely. I have read that if you are using the kefir grains with coconut water they need a spell every now and then in a sugar solution to rejuvenate them. The grains can also be used with water but not with milk or coconut milk- these require milk grains. The end product will have a sweet-sour taste and will last in the fridge for a few weeks. You can use the kefir grains with sugar water and fruit juice/ fresh/dried fruit too- this produces a fizzier end product. When you start using your end product start with a small glass and work your way up otherwise you may end up with stomach cramps. We have a small glass before breakfast and again before dinner.